Figgy loves his family, especially George, but dogs can’t go everywhere little boys go, so Figgy stays home and waits. But waiting is hard! When he can’t wait any longer, Figgy falls asleep and in his dreams becomes . . . a rock star, a pizza chef, and a champion speed racer! Inspired by his dreamy adventures, Figgy dreams up some adventures of his own and gets the whole neighborhood rockin’ and rollin’, until one day the Mustardos bring home a surprise that could make waiting a whole lot easier, and his adventures double the fun. In the spirit of Gene Zion’s Harry the Dirty Dog, Mark Teague’s Dear Mrs. LaRue, and Judy Schachner’s Skippyjon Jones, this clever, energetic story is perfect for anyone who has ever wondered what their pets do when they’re not around. It’s also great for families who value the power of imagination to turn ordinary, boring days into exciting adventures! Marsha Wilson Chall grew up an only child in Minnesota, where her father told her the best stories. 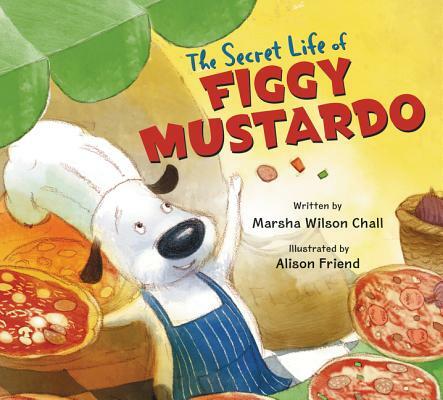 The author of many picture books, including Up North at the Cabin, One Pup's Up, and Pick a Pup, Marsha teaches writing at Hamline University's MFAC program in St. Paul, Minnesota. She lives on a small farm west of Minneapolis with her husband, dog, and barn cats. Alison Friend is the author and illustrator of Freddy & Frito and the Clubhouse Rules, which Kirkus called "a playful, lighthearted lesson about peacekeeping and place-keeping." She is also the illustrator of Making a Friend by Tammi Sauer. She lives with her family in the Lake District in England. Images of Figgy’s daytime antics are done in pencil and digital cartoons to create whimsical scenes; full spreads depict his outrageous events, like the pizza party. An imaginative story about friendship and being lonely that will work in the classroom and make a fun storytime.